December 07, 2016, New Delhi: As deposits exceed over 12.6 lakh crores per media reports and over 3 weeks still left for depositing old currency, an increasing number of citizens now believe that significant amounts of old currency has been laundered into bank accounts via various channels. The total value of old and demonetised currency in ciruclation was between 14.5-15 lakh crores. 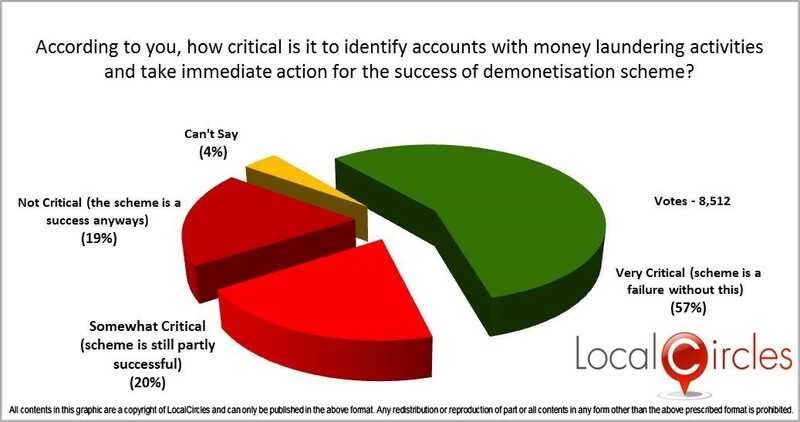 In a poll conducted by LocalCircles between Dec 5-6, approximately 77 percent citizens are now saying that it is critical that accounts with money laundering in the months of November and December 2016 must be identified and scrutinized and that is critical for the success of the demonetisation scheme. 19 percent citizens said doing this was not critical while 4 percent citizens did not have an opinion. Among the 77 percent citizens who believe focus on money laundering is critical, 57 percent said it was very critical and the scheme would be a failure without this. 19 percent said that it was somewhat critical and the scheme is partly successful. Over 8500 citizens from over 200 cities of India participated in this poll. In a related discussion conducted by LocalCircles, citizens braisntormed how withdrawals should be restricted for a period of time to avoid the flow of money out of the laundered accounts. Citizens are proposing that a cash withdrawal limit is placed for six months. Under this scheme, monthly cash withdrawals should be restricted to the higher of monthly average account balance pre demonetisation (between Nov 15 – Oct 16) or INR 50,000 for regular accounts and INR 10,000 for Jan Dhan accounts. 73 percent citizens have supported this model, 20 percent citizens do not support it while 7 percentcitizens did not have an opinion. Over 9000 citizens from over 200 cities of India participated in this poll. Per a recent poll by LocalCircles conducted between Nov 29-30th, 28 percentcitizens said they are yet to deposit their old currency into the bank and planned to do it before Dec 30th. 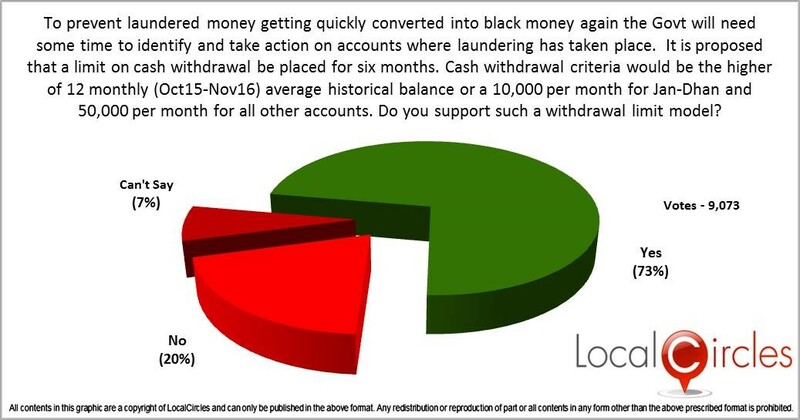 In a related poll between Dec 1-3, 84 percent citizens said they believe that money laundering has been happening post demonetisation. 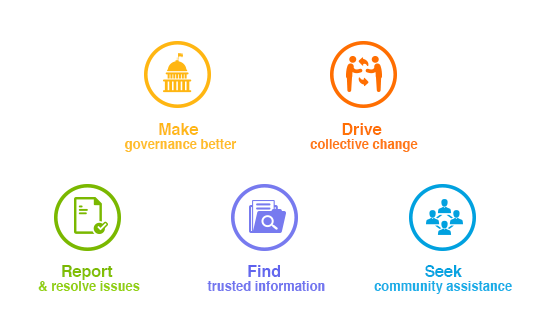 Citizens have also given many inputs on LocalCircles on what should be investigated and that includes transactions by farmers and farm supply chain, property and jewellry sales after April 1-Dec 30th, share assignments in companies without corresponding RTGS transactions, donations at NGOs and temples and any accounts where deposits have suddenly risen in November/December 2016 as compared to previous years. Citizens are also suggesting that advanced analytics software program must be deployed by the investigation agencies such that those who have laundered money are identified while the honest tax payers both citizens and businesses are not harrassed through notices. Citizens strongly believe that any manual enquiries have to backed by such backend capabilities so individual discretion of tax inspector is minimized and scrutinies take place in cases of money laundering.